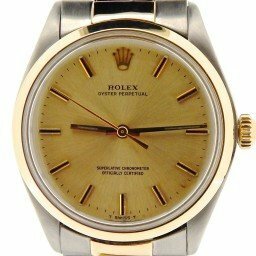 BeckerTime offers a selection of Rolex Oyster Perpetual mens two tone pre owned watches sized 34mm with variety of dials, bezels, and bands. Browse our collection for the timepiece that fits your style and budget. Clearly, wearing a pre-loved Rolex Oyster on your wrist puts you in distinctive company. We also offer a 30-day money-back guarantee and a one year warranty on most watches. In addition, we offer personalized customer service. So, don’t hesitate to contact us for assistance. Also, we offer after-sales support and a Lifetime Trade-Up Guarantee for qualified items. This means you can come back to us when you want to upgrade to another model. While today, only stainless steel versions of the Oyster Perpetual are available, this wasn’t always the case. Take for instance the mens two tone Oyster Perpetual models. 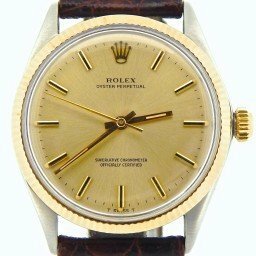 Although these particular two tone Rolex watches are no longer in production, there are a few interesting examples in the secondary market. Let’s delve into some vintage and retro references of the mens two tone Oyster Perpetual. The vintage men’s two tone Oyster Perpetual ref. 100X series was a long-running collection, in production for 30 years from the 1950s well into the 1980s. The models sported a 34mm two tone Oyster case in 14k yellow gold and stainless steel and bezels varied according to the reference numbers. The men’s two tone Oyster Perpetual ref. 1002 includes a smooth bezel, while the more ubiquitous ref. 1005 dons a fluted bezel. 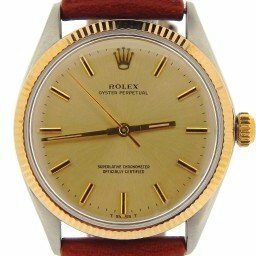 There’s also the rare Rolex Zephyr ref. 1008 that includes the characteristic two tone case, but along with an engine turned gold bezel and crosshair dial. 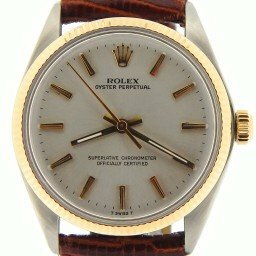 The Rolex Oyster Perpetual watches are no-date time only models. Early models of the two tone Oyster Perpetual ref. 100X series ran on the Cal. 1560 automatic mechanical movement with a frequency rate of 18,000 beats per hour. Later models came equipped with the Cal. 1570, boasting a higher frequency rate of 19,800 beats per hour. Both movements are COSC-certified, thus the dial of the Rolex Oyster Perpetual ref. 1002 and ref. 1005 carry the “Superlative Chronometer Officially Certified” designation. Following the above vintage models, Rolex unveiled the updated five-digit mens two tone Oyster Perpetual in the 1990s. 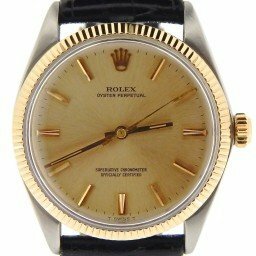 Although the watches retained the 34mm sized Oyster case, the yellow gold was upgraded to 18k. Also, the mens two tone Oyster Perpetual ref. 14203 includes a smooth bezel while the Oyster Perpetual ref. 14233 has the fluted bezel. Both models come along with the signature two tone Oyster bracelet with yellow gold center links flanked by stainless steel outer links. 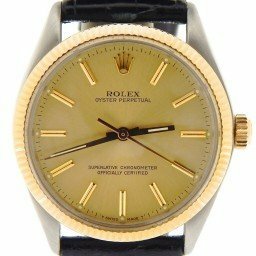 As a more modern Rolex watch, the Oyster Perpetual ref. 14203 and the Oyster Perpetual ref. 14233 are powered by the Rolex Caliber 3000 with a frequency rate of 28,800 beats per hour and a power reserve of 42 hours. Of course, these OP watches are indeed COSC-certified chronometers. Rolex offered a number of dial options on the Oyster Perpetual ref. 14203 and the Oyster Perpetual ref. 14233 including 3,6, and 9 Explorer-style layouts, straightforward stick indexes, and ones with Roman numerals. 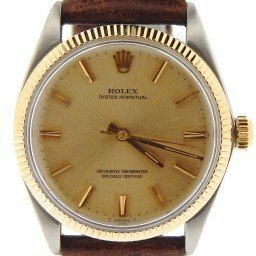 As Rolex no longer manufactures mens two tone Oyster Perpetual watches, the secondary watch market is where to source them. 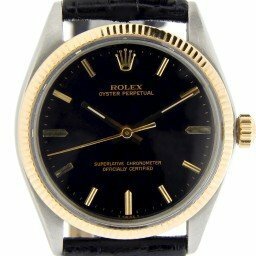 For vintage versions carrying the 4-digit reference numbers such as a pre-owned Rolex ref. 1005, prices start from about the mid $2,500 to about $3,500. For newer models, such as a pre-owned Rolex ref. 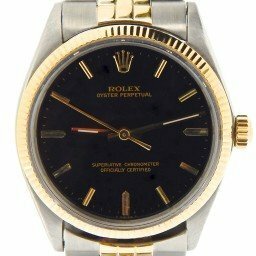 14203 or a used Rolex ref. 14233, expect to pay anywhere from $3,500 to $5,000 depending on condition, year, and availability of packaging and paperwork. The mens two tone Oyster Perpetual watch takes a straightforward time-only Rolex watch and offers more luxury thanks to the use of yellow gold. Given its iconic Rolex design, COSC-certified movements, varied dial options, and accessible price points, these models are a great way to wear a low-key everyday luxury watch.